In a confidential wire leaked by Wikileak, then US Ambassador to Ireland John DJ Moore spoke about the country’s reluctance to take a lead role in the European Community. 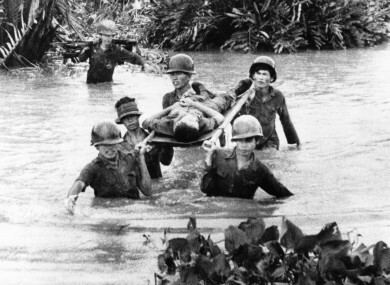 South Vietnamese soldiers carry a wounded soldier across a flooded canal in the lower Mekong Delta, Vietnam on June 23, 1973. THE UNITED STATES Ambassador to Ireland in 1973, John DJ Moore told the White House that Ireland, as “another partitioned country”, had a tendency to identify with the North Vietnamese. In a confidential wire, released by Wikileaks, Ambassador Moore said he believed the Irish government would “not have much enthusiasm” for meeting prospective aid donors to Saigon, the Capital of South Vietnam. At the time, the United States was still assisting South Vietnam with military advisors in the war against a communist army that wanted to unite the country as one nation. Moore said that he thought the government would go along with a joint European Community (EC) operation in which it did not take lead, having only joined that year. “On controversial questions of low domestic priority, Irish have so far avoided a role in the EC, preferring to avoid criticism by going along with consensus,” he said. In addition, Ireland, as “another partitioned country”, has had some tendency to identify with North Vietnamese. Friendly relations with US and anti-communist feelings of public have dampened this tendency, but we doubt that there would be interest in taking part in any action that press might call pro-Saigon. He said the Irish government does have some general interest in foreign aid as a moral imperative but that the actual amounts the Ireland could contribute would be minimal. Moore added that it could have symbolic signficance here and in other countries and that he might ask the government to support a joint EC aid approach to all of Vietnam. Email “US noted Ireland's 'tendency to identify with North Vietnamese' in 1973”. Feedback on “US noted Ireland's 'tendency to identify with North Vietnamese' in 1973”.